The last few weeks have ben a bit of a whirlwind here at Castle Codd. I’ve steadily been busy making things to bring us into the new season, which is one of my favourite of the year, and is now always brought in with a colourful celebration of my little boy’s birthday. We celebrated with family as Darwin turned three. Three whole years we’ve been together as a family now, and the well-recieved wisdom that the days are long but the years are brief feels so very real. I turn 40 in December, and time sometimes feels as if it moves away from me faster than I feel happy for, especially when I feel I have lost a year to illness now, and I can’t help reflect on all of the missed opportunities and experiences that has taken not only from me, but my family as well. But I have better health news recently that gives me hope and renewed positivity that this is not it for me. I hope, on Darwin’s 4th birthday, to feel better than I did on his 3rd. But we had a great celebration of our little guy turning three, and gathering three years of experience, opinions and imagination to his character. As is (by my own making) customary, I decorated Darwin’s cake. We spoke a little about his favourite characters and I presented him a few options, and he decided on Grand Master Glitch from The Go Jetters. I am sure if I had asked him the following week he would as likely have said something else, but it was a great cake to make. Among his gifts, Darwin received a camera of his very own, which will hopefully mean that he can document the world as HE sees it, and it will allow Russell and I to see a small glimpse of the world around him through his own lens, and to feel for the things he finds important. Of course, the very first thing he did was to take a photograph of his food. Decorating Darwin’s birthday cake was one of the few ‘traditions’ I consciously started when Darwin was born. My nan always made and decorated a cake of my choosing when I was small, and Russell’s mum had a big book of children’s cakes that Russell was allowed to choose from when he was small, and so it just felt like something I wanted to do for our little boy, also. None of the cakes I have made have been grand or elegant, but I hope the memories will be ones that he will keep with him as he grows and I will keep on decorating for as long as he is happy for me to do so. Once the birthday celebrations had calmed down, I took to a bit more knitting. The cooler weather brings the welcome comfort of hats. I find hats my most important items of knitwear at the moment. Not only do they hide a bad hair day when I only need to make a five minute walk to the nursery and back, but I increasingly find them a source of comfort and almost protection when I am feeling unwell and the problems with my illness show on my face and hair, as they often do in sore and broken skin and past bouts of hair loss. I keep my hair short to try and mitigate the latter somewhat, now, but that then leads to a colder head… Also cured, lovingly and most comfortably by a hat. 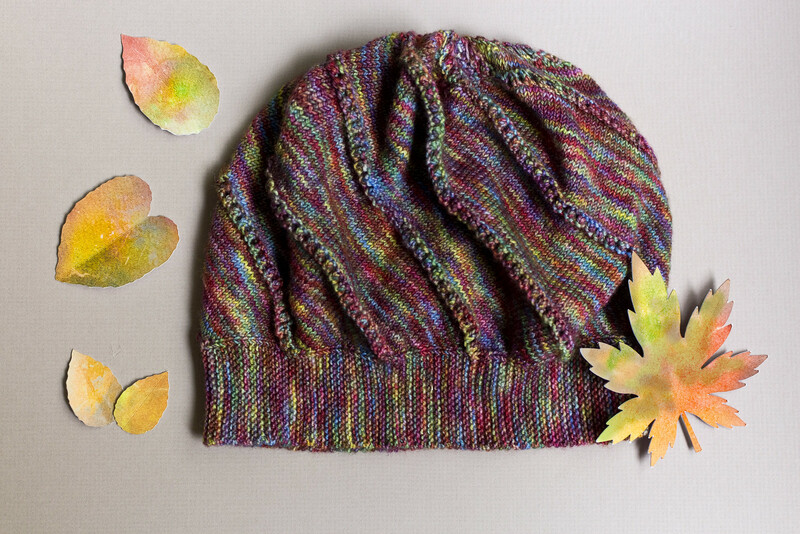 My first hat of the season was Lamitra by Woolly Wormhead. Slightly slouchy and very forgiving when you feel like you’d like to have the buffer of hair around you but don’t actually have much. The autumnal colours in the Lamitra I’ve knitted were perfect as the season began to change, and reminded me of the past papercraft project Darwin and I worked on together. The leaves in the picture above are the few left over from the tissue paper watercolour sheets that Darwin and I worked on some weeks ago. 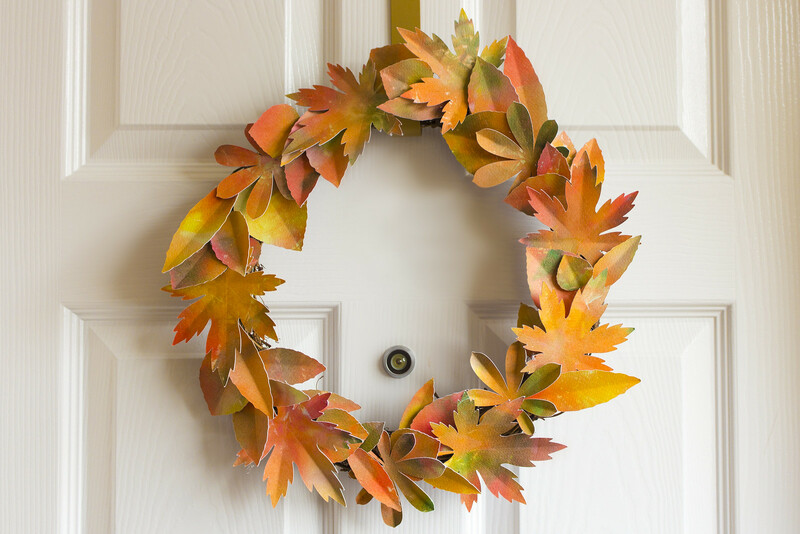 The rest have finally been made into a simple wreath to hang at our front door. 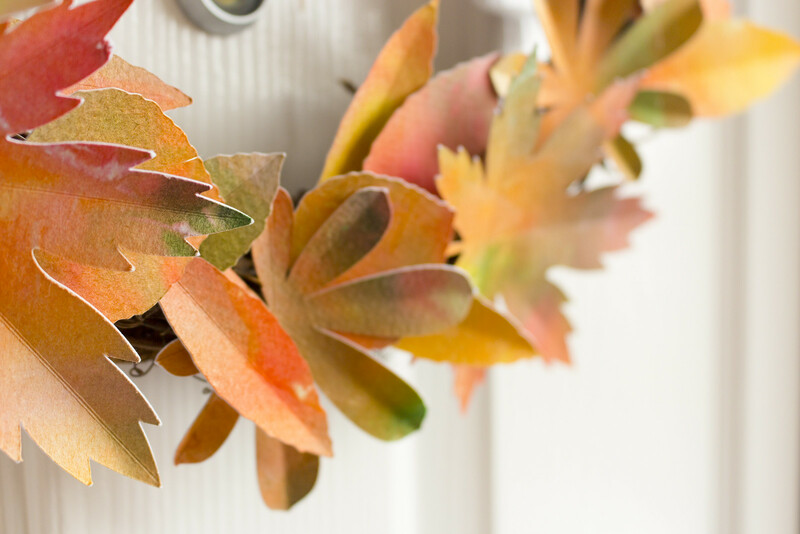 The leaves we created were simply glued onto a pre-made wreath form, using a hot glue gun, overlapping so that after the first leaf was glued on the next was made to overlap with the bottom (stalk end) of the first leaf being covered with the top of the next leaf. 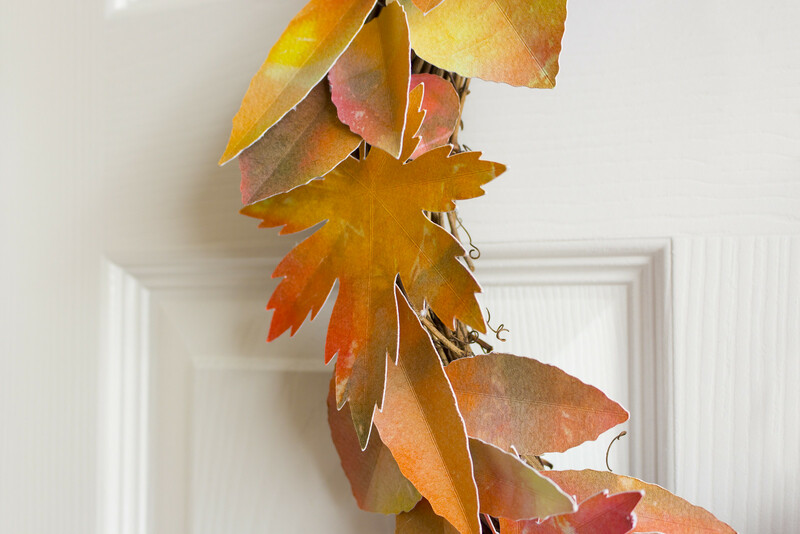 The wreath form is a 30cm rattan twisted burlywood wreath form that I found on eBay for £2.70 and was the perfect size for the number of leaves that we had created in one of our toddler craft afternoons last month. I’ve never really decorated for autumn, beyond the celebrations of Darwin’s birthday, though the richness of colour and ease of weather make it one of my favourite times of year, so this year I am celebrating with the warmth of family and in gratitude for love and friendship, and this is a little touch to welcome home my family any day, plus any visitors that call by in the shortening days. Wishing to comfort to all that read this. I’ll be back with a few more exciting projects very soon.